The Spot Vital Signs LXi, the latest patient monitor in the WelchAllyn Spot series, provides not only more parameters, but can also be connected to some digital scales. In addition to parameters measured, the patient monitor from Welch Allyn can also manually record additional details, such as level of pain and respiratory rate. The Spot Vital Signs XLi patient monitor has connections for electronic data transfer, so the results can be transferred to an electronic patient record. 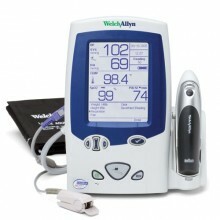 - Can be connected to the digital scales "Health o meter" and "Tanita"
Click the button below to add the Welch Allyn Spot Vital Signs LXi Surveillance Monitor to your wish list.